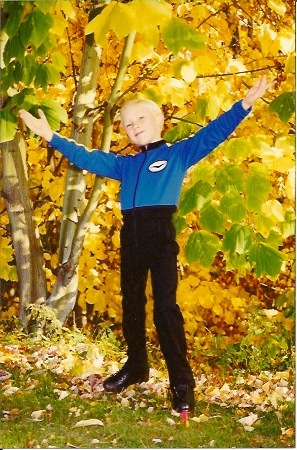 Ross began skating at age 3. He started skating with hockey skates but was intrigued by the figure skating sessions that took place after his hockey practice, so his mom bought him a pair of figure skates. “They were white because my feet were too small for boys’ skates, so we had them dyed black.” Besides his indoor sessions, Ross would also skate on the outdoor speed skating oval right down the road from his house in Williston, Vermont – and his Dad even built him an outdoor rink in the backyard every winter. As a young skater, Ross enjoyed learning new and unique tricks, but often had a hard time focusing in practice, driving his coach crazy when he did focus in competition! Performing for an audience was something Ross especially relished. In these early years, Ross represented the Skating Club of Lake Placid, as there was a much larger emphasis on figure skating versus hockey. He loved spending part of each summer training in Lake Placid, a beautiful resort town, and appreciated the opportunity to connect with skaters from all over the country. During these years Ross participated in club competitions throughout New England. A little known fact is that Ross was simultaneously a member of a co-ed precision team for two years. “At one of the rinks in Vermont, you can still find a picture of me with my synchro team – my friends have frequently used that picture of me in that costume as blackmail!! !” From 1996 to 2003, Ross was coached in Vermont by Edmund Nesti, and worked with several choreographers including Nathan Birch and John Lee. 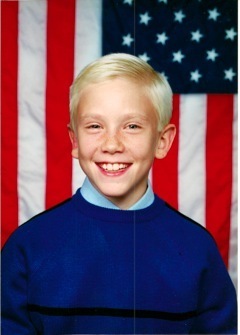 At the age of 9, Ross participated in his first U.S. Junior Figure Skating Championships’, where he made many of the skating friends he still has today. He had modest success at this level, missing the final rounds by one position over the first few years. From 1995 to 2003, Ross played hockey from the Mini-Mite through the Peewee level. Many weekends on the travel team circuit were devoted to tournaments located throughout Vermont, New Hampshire and upstate New York, playing left wing and center. His skating skills were advanced versus his teammates, due to his figure skating training and the emphasis on edges. He was often able to lap his colleagues on backward crossover drills. Ross did have one significant challenge, as during his youth he was always one of the smaller (or, as Ross labeled it, “vertically challenged”), players on the team. He really loved both hockey and figure skating, but the demands of hockey would soon collide with the realities of his figure skating life. 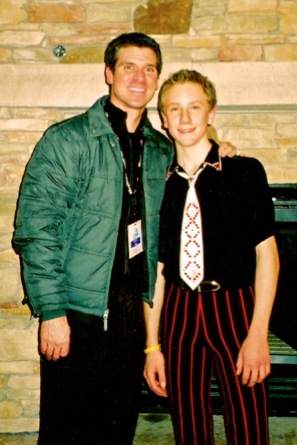 In early 2003, some very trusted friends from the figure skating world approached Ross’ parents and indicated that Ross had true talent on the ice – and that the family needed to consider options other than the training and ice time that was available in Vermont in order to take advantage of these gifts. The family had a serious discussion with the then 12 year old Ross, who had to make a most important decision – stay in Vermont and maintain a “recreational” approach to both hockey and figure skating, or relocate in order to dedicate himself to reaching his potential in figure skating. Ross tried out two different locations, selecting The Skating Club of Boston primarily due to his immediate rapport with his new coaching team and his camaraderie with the other elite athletes training there. In August of 2003 Ross and his family relocated to Boston and Ross embarked upon a different adventure, working with his new coaches - Mark Mitchell and Peter Johansson. 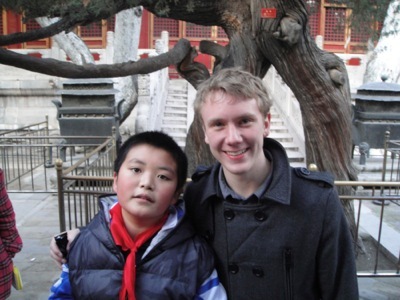 Ross states “I am very happy that Mark and Peter decided to accept me as a student, as I had only a single axel and couldn’t land a clean double jump.” At first, Peter would instruct Ross to do a specific jump, only to be surprised when Ross did a completely different one! However, Ross soon learned how to focus and improved rapidly under the tutelage of his new coaches. He also learned that there is only one silver bullet in skating – good training. He was inspired daily by his rink mates – great skaters like Juliana Cannarozzo, Scott Smith, Curran Oi and Britney Rizo, to name just a few. After two full years of instruction with Mark and Peter, Ross competed at the 2006 U.S. Junior Figure Skating Championships’ in Jamestown, making it to the final round with a 4th place in the short, and ended up 8th in intermediate that year. Sometimes, however, winning can mean losing – losing perspective and losing your competitive edge and hunger to work. At 14, unfortunately, Ross now admits he thought he was “all set!” Combine that mindset with the rapid growth of the typical 14 year old male and you have a recipe for disaster. Ross needed to really step it up at Eastern Sectionals that year, as Novice Men were especially competitive. After winning the short with his surfer boy routine, he had an uncharacteristic pop on the first jump of Casablanca #1, and was unsettled enough to fail to maximize the other elements in his program. He ended up missing his first trip to the “Big” Nationals by .27 of a point – heartbreaking but perhaps a life lesson to be learned. Ross was extremely disappointed with himself and really looked deep within to decide what his next steps should be. After watching the 2007 Nationals in Spokane, WA from a spectator seat, Ross knew he had to channel his letdown into his training on a daily basis. He made a commitment to increase his physical stamina and hone his mental focus, sitting down with Mark and Peter to develop a plan, and began working with a sports psychologist. Hard work paid off as he earned the title of 2008 Eastern Novice Mens’ Champion, and went on to become the Silver Medalist at the 2008 U.S. Championships. That spring, he made the successful transition to the junior level, winning the silver medal at the International Gardena Spring Trophy in Selva Val Gardena, Italy. Later that year, Ross was chosen to participate in the Junior Grand Prix, earning a first place finish at the U.S. Junior Grand Prix in Lake Placid, a second place finish at the Junior Grand Prix in Zagreb, Croatia, and the bronze medal at the 2009 Junior Grand Prix Final in Tokyo, Japan. 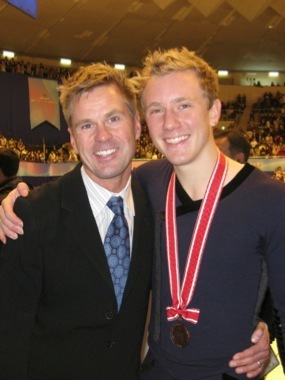 Ross had planned to make his senior debut at the 2010 U.S. Championships in Spokane again, but had to withdraw due to a sprained ankle sustained while completing a Triple Axel in practice at the Skating Club of Boston just one week prior to the event. He was also named to the World Junior team that season but later withdrew because of the same injury. Needless to say, this new attitude toward training and its subsequent execution paid huge dividends. Ross made his senior national debut at the 2011 U.S. Championships in Greensboro, N.C. and won the bronze medal, which earned him a spot on the 2011 World Championship Team. He finished 11th at Worlds. This past fall, Ross kicked off the 2011-12 international season with a Grand Prix assignment at Skate Canada, where he placed 6th, followed closely by his second Grand Prix assignment, the NHK Trophy, held in Sapporo, Japan. Buoyed up by the amazingly supportive Japanese skating community, Ross earned his first Grand Prix medal, one of only two American men to medal on the Grand Prix series in 2011. At the 2012 U.S. Championships in San Jose this past January, Ross was able to repeat his success by again earning the title of U.S. Senior Men’s Bronze medalist. It made his 21st birthday very special. Ross said, “I can’t think of a better way to celebrate than to be at U.S. Nationals, doing something I love, with so many friends I love to see – it’s like a giant birthday party every year!” Two weeks later, Ross competed for the US at the Four Continents Championships in Colorado Springs, Colorado, where he earned the Bronze Medal – his first ISU Championship medal! Ross’s hobbies include tennis, guitar, golf and cycling. He also enjoys playing board games like Scrabble, and even invented something “unimaginatively called Ping-Pong Tennis” with fellow Team USA skaters Stephen Carriere and Scott Smith. “It’s basically tennis played with ping pong paddles and balls on a wooden floor using a badminton net,” according to Ross.